In July 2012 Missouri declared all 114 Counties “Primary Natural Disaster Areas” following the worst drought in 30 years. The report quotes “Numerous portions of the state experienced severe to extreme drought resulting low water conditions in many lakes and streams, including Crane Creek. Overall, the trout population fared well and appeared to be healthy despite the harsh conditions in 2012”. The last sentence should bring on a smile but not necessarily allow us to cheer too loud! It would seem that the Upper WRCA has suffered the most due to low precipitation as one would expect, while the Lower WRCA seems to have fared better. In 1994 a visual survey reported 606 trout per mile in the Upper WRCA which declined to an estimated 95 trout per mile in 1999 and 2005. Contributing factors were obviously the low water situation and a high level of predation from piscivores (I love that word!) like otter and heron (+ poaching?). The population improved in 2009 with 271 fish per mile possibly due to increased stream flows and reduced otter population (licensed trapping). An abundant population has been observed in the Lower WRCA during 2005, 2009 and 2012 possibly because of the better water conditions. What is most pleasing about the report is the section concerning private land, particularly the property on which I have permission to guide. The report quotes “Historically, the population of rainbow trout in Crane Creek has remained strong possibly due to private ownership, low harvest rates, and adequate habitat”. Some in the fishing fraternity would wish that Crane Creek be opened to public access along its whole length in the mistaken belief that it is a “navigable stream”. It would seem that the experts believe that having sections in private hands provides a nursery for the “beats” which do allow public access. As the report further states, “Reports from fishermen suggest that trout may inhabit portions of Crane Creek all the way downstream to the confluence of the James River during the winter months when water temperatures are cooler”. So assumedly they move! The owner of the private land to which I have access is very keen on seeing the stream improve for fishing and has expended a large amount of personal labor and money into seeing this happen. He is a true “River Keeper” and endeavors to maintain the “Blue Ribbon” status of the stream for future generations. He even has plans to incorporate “Lunker Structures” into any bank stabilization which will provide further support to the trout population and improve the general fishing situation. While the MDC supports this kind of improvement, it does not necessarily fund it, so anyone undertaking it does so at their own expense. Although this landowner often has cattle on his land he has made a great effort to prevent them accessing the stream, thereby causing further erosion and increased nitrogen due to “droppings”! In addition he is endeavoring to encourage his neighboring landowners in similar practices which can only have a positive effect on the stream. So without this kind of ownership the other areas of Crane Creek would certainly suffer and I would hope that users of the stream would appreciate this fact and respect it. Thirteen individual P/R sites were identified and marked along a section of private land upstream of lower WRCA and downstream of the City of Crane. This particular section of private land has been the site of recent NRCS and MDC cost share based riparian plantings and streambank stabilization. The landowner has been a great cooperator with MDC and was more than willing to allow us to snorkel the section of Crane Creek that runs through his land. Direct counts were conducted on October 3, 2012. 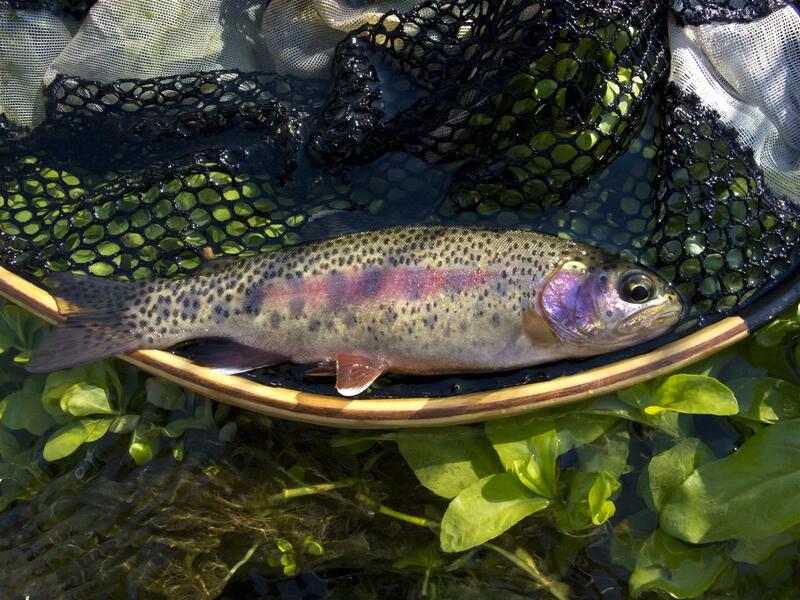 A total of 423 rainbow trout were counted in a 0.6 mile reach of stream which extrapolates to 705 trout/mile. This section of Crane Creek had higher densities of rainbow trout in all size ranges, and we observed five times as many rainbow trout greater than 18” than on either section of WRCA. This is likely due to better trout habitat in this reach and decreased fishing pressure. Siepker (2008) documented that better quality riffle habitat existed within the private land section versus the lower WRCA. Using a classification system of 1, 2, and 3 with 1 being the best quality habitat, 78 percent of riffle habitat on the private land was classified as a 2, with only 42 percent classified as 2 on lower WRCA. In addition, the landowner allows very little fishing and only fishes with dry flies with barbless hooks in this reach. The highest number of rainbow trout < 8” was observed in P/R J06, which corresponds with the section of stream recently reconstructed as part of a streambank stabilization. This area was once a series of slow moving pools and is now characterized as a long, shallow riffle with a rip-rap bank. My conclusion is that the report shows Crane Creek’s current trout population in a positive light despite all that nature (and humans) has thrown at it. I also believe that the balance of public and private land is an aid to this, thereby improving the fishing throughout the steam. Anyone who accesses the public areas could assist in improving the overall fishing situation but simple means. Examples of this would be trash removal (take a trash sack when you fish and haul out a few items your find), ensuring that they don’t bring invasive species into the stream like Didymo (Didymosphenia geminata, see my Blog entry: Norfork Fishing Report), avoid wading if possible, not to mention reporting infringements of the law. It would be nice if we could reduce actual fishing pressure in the public areas so the stream is not “over fished” and thereby reduce the impact on the stream and its fish. Of course this would be difficult to control and somewhat unfair on those who have travelled distances to fish. So maybe the approach could be to only fish during “low traffic” periods if you’re a local and allow the “out of towners” to fish the weekends. Maybe if you live locally and arrive to find the parking lot with four or five vehicles, the best approach would be to come back another day rather than add to the pressure. Of course after doing this a number of times one is going to say “the hell with it!” and join the crowds! Another option is the possibility of operating a “reservation” system on WRCA’s something like what has been used in the past at some MDC Quail Project areas. Everyone seems to agree that increased fishing pressure on the stream has a detrimental effect but nobody has a complete answer to that issue but hopefully you get the gist of what I’m suggesting. Crane Creek is a National Treasure and we should be proud that it is in our back yard. An anecdote I would relate about this stream involves a fly fisherman who was in a major Fly Fishing Supplier’s store in London, England. On the wall was a chart giving trout species of North America and one of the smartly dressed sales associates pointed to the McCloud Rainbow trout picture and said “You know that one of the only remaining self -sustaining populations of that specie are found in Crane Creek, Missouri”. The fisherman replied “I know; I live there”! So even in Jolly Old England they have heard of Crane Creek, Missouri! This is what all the fuss is about! This entry was posted in Fly Fishing, Stream Report, Uncategorized and tagged casting, crane, crane creek, fish, fishing, fly casting, fly fishing, keith, lunker structures, MDC report, missouri, oxby, ozarkenglishman, rainbow trout, teach, teaching, trout. Bookmark the permalink. bookmarked! !, ӏ like youг web site!